Hi Everyone! I’m Holly from Holly & Company and I am so excited to be sharing this project with you. I’m a jack of all trades crafter who dabbles in scrapbooking, sewing and photography. I also really enjoy digital design and even make free printables on occasion, you can find those here. My family moved to Texas a year ago and we enjoying being immersed in all things Texas. Summer in Texas brings high temperatures and afternoon thunderstorms, which means we actually spend a fair amount of summer vacation indoors. We fill the time inside with reading books, watching movies, testing out new recipes and probably most importantly, crafts. When I saw this collection, I knew the chalkboard paper would be so fun to use with metallic pens and markers. The matte black surface is a perfect blank slate for creativity. I decided these chalkboard paper crowns would be a perfect way to use that blank slate. First, gather all your supplies. Bright colors, metallic and glitter show up beautifully on the dark backgrounds. We used markers, jewels, tape and flowers. You could also use confetti, stickers and any other bits you can find. Second, cut out your crown. I used a shape from the Silhouette store, but you could easily draw one and cut it out by hand. Finally, enjoy being the envy of all your friends. Seriously, we had such a fun time making these. The best part about crafts like these is there are no rules! Anything goes. 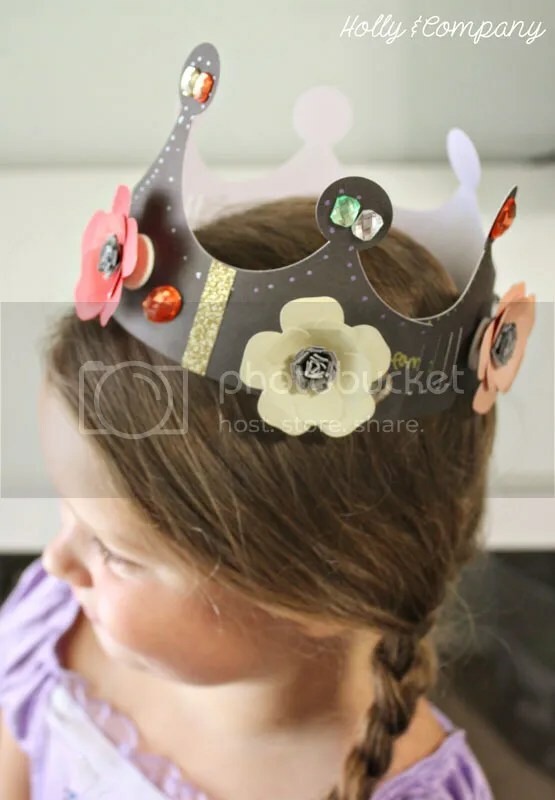 This is a perfect play date activity, because the kids can’t wait to wear the crowns while playing pretend. As you can see, a princess dress was required to show off her beautiful creation. I hope you enjoyed my tutorial. I love being able to use paper crafting supplies for projects outside the normal scrapbooking realm. It’s ideas like these that make me happy I have a stash of craft supplies to use. If you don’t have little ones to do this craft with, you could also do this for a wedding shower, birthday party or even a girl’s night in! Thanks Holly! 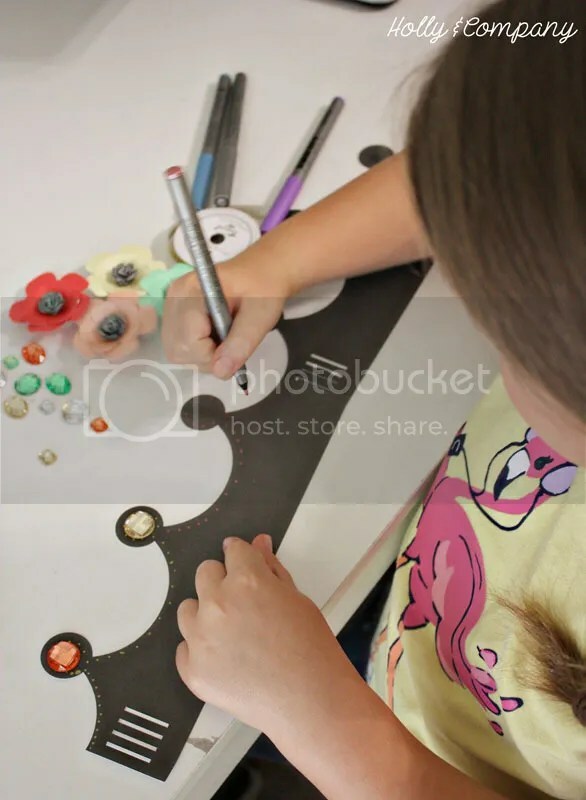 I just love this cute idea for a kid craft, and it’s so pretty, it would be fun for a girl’s night too! I just love this Embroidered Map Tutorial! Such a fun idea! She also has fun sewing projects like this Anthropologie Inspired Heart Pillow! And, I know it’s early, but I love Halloween, so of course, I loved this No Sew Trick or Treat Bag idea! Join Me August 8 at The Container Store in SLC – RSVP and get 20% off!